A British Airways (BA) flight from Amsterdam with 71 people on board lost its front wheels in a "hard landing" at London City Airport. 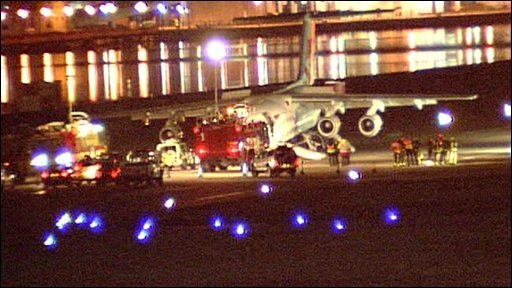 The plane skidded to a halt on the runway and passengers were taken off using the emergency chutes. One person was taken to hospital with minor injuries. All 67 passengers and four crew were safely evacuated. BA said: "The nosewheel of a British Airways aircraft suffered a failure on landing at London City Airport." The airport was closed after the crash landing which happened at about 1945 GMT on Friday. It reopened in the early hours of Saturday but passengers have been advised to expect some delays. A spokeswoman from London City Airport said a total of 11 flights were diverted - eight to Stansted Airport, one to Heathrow, one to Luton and one to Southend airport in Essex. Justin Fletcher, a passenger on the plane, a BAE Systems-manufactured Avro RJ100, said: "There was quite a loud bang as the plane scratched in. "The stewards and stewardesses were quick to evacuate everyone off. "There was a few scrapes and cuts due to hitting the asphalt, all in all everyone seems to be doing quite well now." Another passenger, Ray Hamblin, said people tried to stay calm. "People were pretty calm at first but when the plane started to fill up with smoke people were not moving fast enough and they got pretty fractious." A statement from BA said: "As a precaution the emergency slides were deployed and the passengers were evacuated down the slides onto the runway. "Unfortunately one passenger sustained a minor injury and is currently on the way to hospital. There was one other minor injury. "We don't know the nature of the injury or how it was caused yet." Passengers and crew members were being cared for by ground staff at the airport. A spokesman for the London Ambulance Service said: "We sent six ambulance crews, two single responders in cars, two duty officers and we treated four patients for minor injuries." A spokesman for the Air Accidents Investigation Branch (AAIB) said: "The AAIB has started a field investigation following the incident at London City Airport and three of our investigators have been sent to the scene." Five Red Cross emergency response vehicles were sent to the incident. Jonathan Edmondson, Red Cross emergency response manager for London, said: "Our staff and volunteers were on the scene soon after the incident to provide medical support and also to attend to the emotional well-being of the people involved. "Our staff have also provided practical support, such as distributing some basic hygiene items to passengers while they waited for bags to be unloaded from the aircraft." On 5 February the runway had to be closed because of a problem with the nose wheel on another aircraft of the same type. An airport spokesman said the wheel was bent on a plane arriving from Glasgow which caused the runway to be closed for about an hour although there was no emergency evacuation. London City Airport handled 3.3m passengers last year and is home to 10 airlines which serve more than 30 destinations in the UK and Europe. Are you or do you have friends at London City Airport? Do you know anyone who was onboard the aircraft? Please send us your comments using the form at the bottom.